I have to say man, your 3D skills are amazing! I'm loving this. I'm also seeing that your posting lots of stuff and making tons of progress which makes me really happy :). Sorry for not posting any feedback i haven't been very active those past 10 days or so. But i will definately keep an eye out from now on. A bit late to the party but here's some feedback on this :). First things first, your linework is indeed a lot better and confident in this drawing which is really nice to see. Keep it up :). Now i don't have a lot of things to add as you did a pretty good job as always. Here's the main three. As you pointed out yourself the chest looks a bit different. It's a bit pushed out indeed but i think it's also the perspective that's different. In the original picture we see the chest from 'below'. The horizon line is around pelvis height. Dont let the fact that we dont see under her chin confuse you, it's because of the angle of her head. On the contrary in your version the horizon line seems to be above her chest as if we're looking down on her. I'd also pay a bit more attention to her curvature. The curve under her chest (on the left side) looks like a 'C' while your's looks like a reverse 'S' . The second thing i'd like to add is her balance. your version seems to be leaning a bit forward and i almost get the feeling that she would fall. It's easy to ignore this when focusing on details etc and it's something i mess up all the time xD. So a good solution to this is to make a solid gesture drawing/stick figure first. Lastly and this is pretty minor but i feel like her legs are a bit too 'thick' at their top. That's it. Again overall you did great and the anatomy is pretty spot on. And i also need to point out that i'm actually not that good at drawing females so take all of this with a grain of salt xP. Thanks a lot. I'm just trying to get better at 3d as well. Also no problem. Look forward to the feedback in the future. Thanks a bunch for the feedback. It's pretty spot on really. The way the head is drawn was confusing. Nice work noticing that. Great observations for the stomach and legs. I see it better now. You're welcome mate, happy to help :). 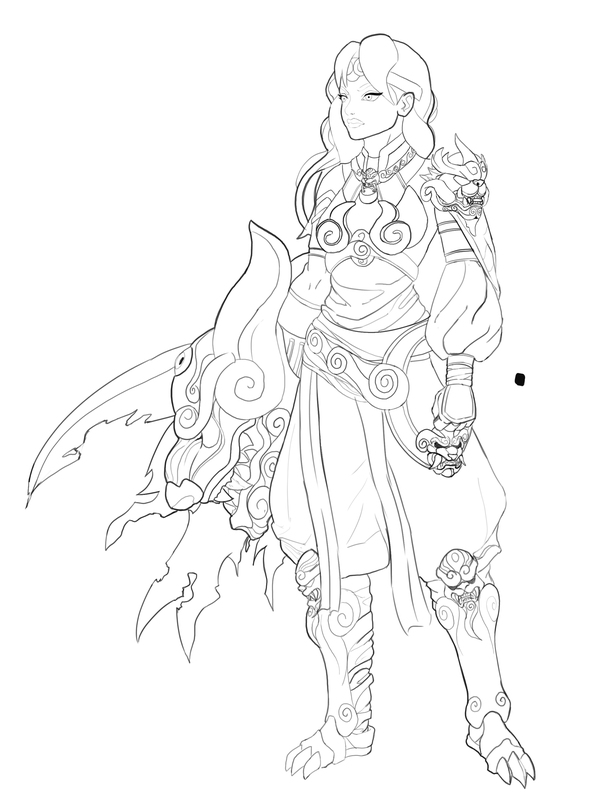 Lines are done-ish. Colors next. Luckily I know what they are thanks to my new method. 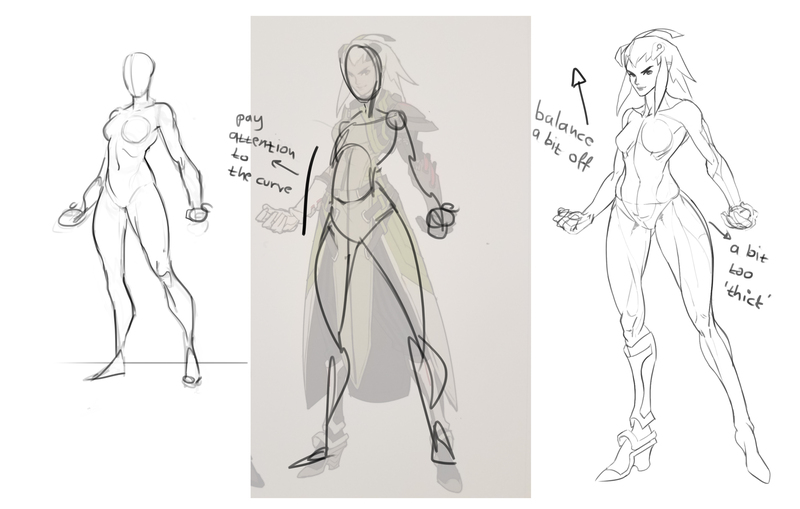 Hopefully some of the overwatch studies show through a bit. I still need to work on my line quality and be more loose. One more thing, i wouldn't suggest putting detail from top to bottom. Just like painting, you use light as a source of where to direct the eye, same goes with detail, if you have a ton of noise going on in the feet, people will look there and not the face, if you have a ton of detail everywhere, people don't know where to look and the design subconsciously becomes a tiny bit dull, by pulling all the attention up to the top with cool little details and leaving the bottom as a rest point then people will be more inclined to look at the face which is the most important part of a character. While what you said is true and would be tremendous advice for a line drawing i wouldn't encourage spending time on lineweight on this. It is meant to be painted and as such the lines will dissapear almost completely by the end. It's definately a good idea to practise lineweight at some point tho. This honestly has to be one of the coolest concepts you've drawn :). The studies definately show through! The character is very readable. your focal points are clear and yet you leave enough 'free space' for the eyes to rest. The dragon theme is clear aswell from the obvious shoulders and weapon to the rough, wing like cape and then the boots with the claws. Everything fits really nice together. The drawing is pretty tight and the only thing i'd recomend taking another look at is some of the folds, particularly on her arm. Marc has a great vid on drawing folds in case you haven't seen it yet. Rly looking forward to seeing this colored. @Fris Thanks a lot for the feedback. The line weight can definitely be better. What you wrote made sense. Thanks for the feedback. @Firathion Glad you like the concept a lot. Your right, I will be painting over the lines anyway. I might need a refresher on folds so I'll check the video again. I went with so many iterations. Hard to find good reference for the arm. Thanks a lot for the feedback as always. Lost a bit of work but heres a wip as I start to color and render this girl. Not sure if I should go for my usual render style like in my previous finished work or should I try to get close to overwatch style of rendering; where things are a bit simpler. I need this in overwatch. 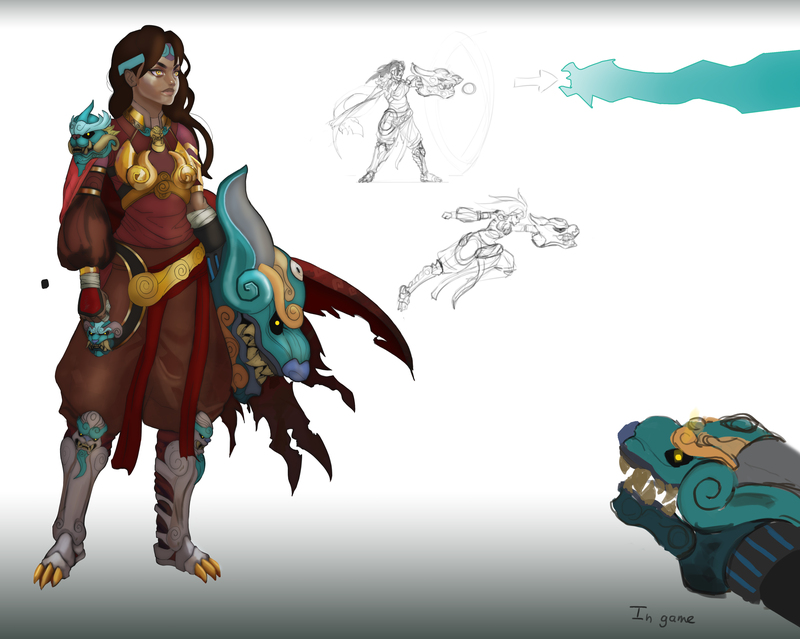 No joke, i'd play the heck out of her :P.
I love how this character is shaping up. The design is really cool and I like the rendering you're going for looks pretty nice too (at least judging from what you did for her face). @Firathion thanks a bunch bro. 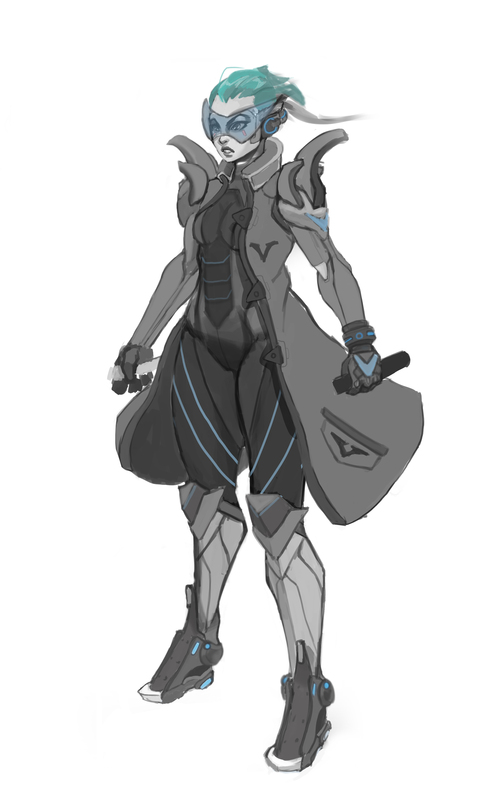 Overwatch style it is. I look forward to the feedback. @cedricgo thanks as well bro. I'm gonna try to make this as cool as possible. I don't have anything to add honestly. You could argue that the colors on her heapon and shoulders stand out to much but i personally like it. I feel like the weapon should be the focal point in a 1st person shooter game like overwatch plus the cold colors of the weapon vs the warm colors of the rest of the outfit create some pretty sweet contrast. Will wait to see the rendered version before commenting further. So far she is shaping to be my favorite along with your druid :)! Thanks for the feedback. 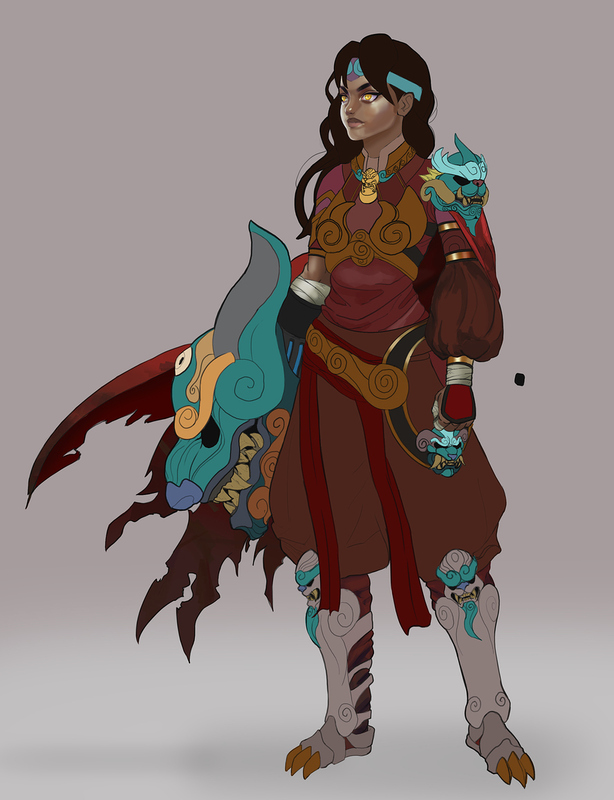 After taking a few days off and doing Artwar stuff, I can see what you mean about the shoulder and headband colors. A warm and cold color contrast was what I was going for. Maybe I'll just keep it for now because I like it as well. If it looks weird in the render, then maybe i'll change it to work better. Here shoulders are based off of a atlas beetle. I just curved the main horns differently. Some movement sketches off on the side. Might do a few more. "very sketchy"
Worked on the character polish a bit more as well. You're designs are so cool! Thanks a lot. Glad you like them.